It will be 100 years since the Armistice on 11th November 2018. 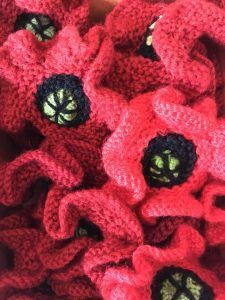 Cholsey Ladies have knitted poppies to support the British Legion Appeal this year and plan to decorate the Forty with 1000 poppies for the Ceremony on Armistice Day at 10.45am. Cholsey CDT is supporting their appeal by selling knitted poppy broaches for a suggested donation of £2. Message me if you would like one, or pop into the office in the Great Hall during opening hours.